Are you Holden hero, a Ford Fanatic or just someone who likes V8's? 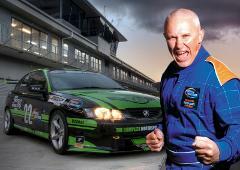 Come and get into one of our race prepared V8's and feel the thrill and excitement of taking to a race track. The experience starts by heading into a DVD briefing which runs through the theory of driving on a race track along with the safety aspects of the day. Once the briefing is done, then it's off to the pit lane where the fun starts!! Your on-track experience starts by getting suited up in our race suit and race boots then into our tuition car for an introduction lap around the circuit with one of our in-car consultants talking you around the track while your in the passenger seat. This will give you an idea of what to expect and what you've got yourself in for!!! And if you want, you can take a spectator along for the ride so they can experience the thrill of being on a racetrack. Having chosen your favourite, it's now time to drive it! Get strapped into one of our V8's and experience the stunning performance of these cars as you and your professional instructor lap the circuit at speeds you never thought possible you'd get up to. With your laps complete but your heart still racing, you head back to the pitlane where you receive a certificate complete with your fastest laptime as proof that it wasn't just a dream. *NB All products are based on Taupo's Track 3. However occasionally when we have to use Track 1 or 2(over twice as long) you'll get the same drive time or more on the track but you'll only do half the number of laps.